Ships from and sold by eToolDirect. 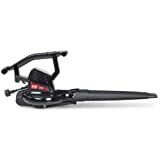 Amazon's Choice for "dewalt leaf blower"
Buy this product Renewed and save $26.70. Ships from and sold by HE YI. Ships from and sold by CPO Outlets. 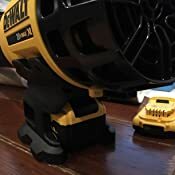 Dewalt, 20V blower, brushless motor maximizing motor efficiency & durability, innovative axial fan design that maximizes on air output & run time, 400 CFM & 90 mph performance, lightweight & ergonomic design 7. 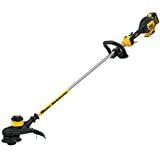 1 lb, low noise 61 db, variable trigger & Speed lock, part of the 20V Max system of tools. Background: I'm a typical suburban home owner. 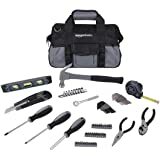 I've been through a variety of 18v/36v/40v Black & Decker, and more recently, Greenworks 40v outdoor tools. As of this week when I got this blower, my outdoor tool rack and charging area (along with a chainsaw and mower), is definitely green themed. 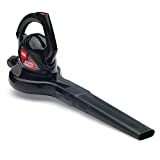 I was very impressed with this blower. 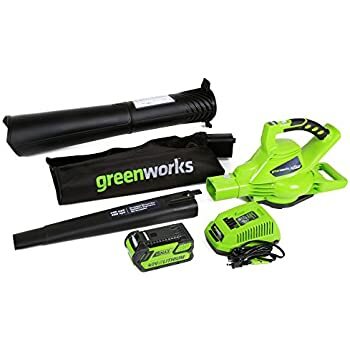 My current champion of blowing is the Greenworks brushless 40v blower. The Greenworks is full featured with a tube and bagger that lets it mulch leaves, and has a positively huge 40v 4ah battery on it. 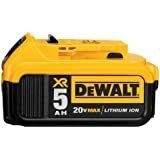 The DeWalt performs similarly however, while being smaller with a lighter/smaller tool battery... in fact it outlasted the Greenworks (see below). One thing I really see when comparing the two is that the Greenworks has a long necked-down tube with the statement "185 MPH" on it... what they fail to mention is the CFM which probably isn't that great. 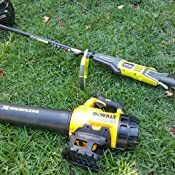 The DeWalt, on the other hand, has a large tube all the way out and the output covers a much greater area. 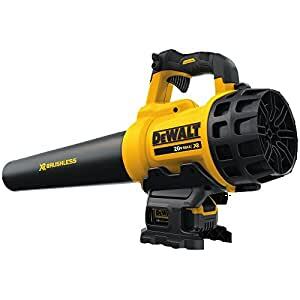 They both have similar overall output/usefulness, and both have roughly the same sound level... the Greenworks has more of a "classic" blower sound, while the DeWalt, with its' turbine/jet style setup, has more of a high pitched buzzing sound. One thing I really liked on the DeWalt is the instant-on trigger versus the Greenworks. To start the DeWalt, just squeeze. To start the Greenworks you have to push the power button, push the turbo button (to get full power), THEN dial up a speed on the wheel (there's not a trigger). Here's a real-world battery test. I timed both blowers at full possible speed and what I judge to be comparable outputs. DeWalt blower on full throttle, Greenworks on full, plus "turbo" button engaged. So, yeah, the DeWalt ran for half again as long. The Greenworks was left cooling down while I used the DeWalt all over the back yard. After the test was complete, both batteries were warm but not hot and the cutoff on both was electronic/immediate. They also both started out on the chargers with overheat/cooldown warnings on the charger before they would charge. That seems a common theme with li-ion battery setups. no power-on and turbo buttons... pull the trigger, get instant-on full power. compares favorably/reasonable with a tool that is double the power/voltage. 5.0 out of 5 starsThis things BLOWS (in a good way)! 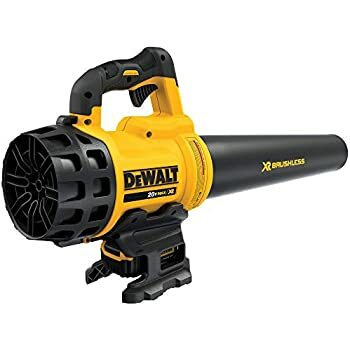 I have 8 DeWALT 20 V Max tools, and just purchased this blower... so 9 now. 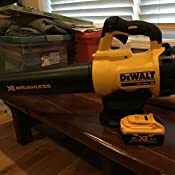 I researched all of the DeWALT cordless blowers, and this one seemed to suit our needs the best. 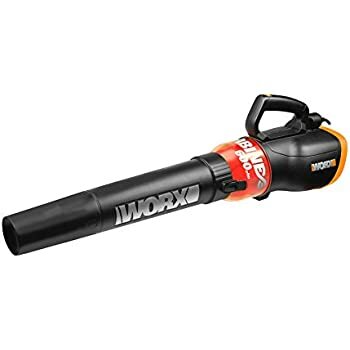 It's significantly less expensive than the 40V or the new 60V FlexVolt blower - and if the job's really big I breakout my Mac Daddy Stihl backpack 340 blower. 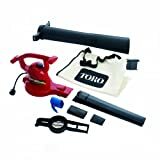 I love having a cordless blower so I can roam around our property with hassling with a cord. 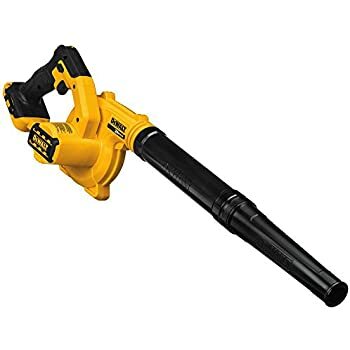 I REALLY like the speed control on this blower... very sensitive, and I like being able to just squeeze the trigger a little to blow debris away from sensitive areas like flower beds, etc. without blowing the dirt everywhere with too much air. 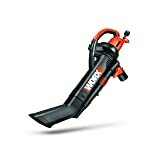 The large blow tube is nice, because it puts out a large wide column of air at a max of 90 MPH - which is plenty unless I'm blowing off huge quantities of fallen leaves in the spring or fall that require the big Stihl backpack blower. I also really like the stand that allows me to set the blower down and have it upright and ready to pick up again. 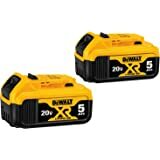 DeWALT's brushless MAX line of cordless tools are the best things ever for the home handyman! I use my collection all the time, and I really like having a common battery that will work in all of them. 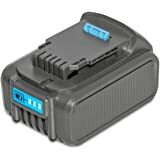 I have 8 4A batteries and 2 2A ones that came wth the various tools, and each battery has its own charger - so I never have a dead battery problem. This blower comes with a 5A battery that is the exact same external size as the 4A ones, and it's own charger. I haven't run the battery all the way down yet - but I blew for probably 25 mins yesterday and the battery was still going strong when I stopped. Brushless motors ROCK! Well done, DeWALT! Highly recommended! 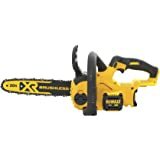 I'm also considering the DeWALT 60V FlexVolt Chain Saw, to replace my aging Stihl chainsaw. 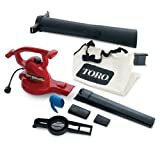 I own a corded Toro blower/mulcher combination that works great, but is so cumbersome to use and change from blow to vacuum mode, I never use it. 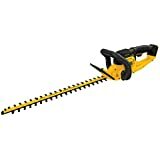 I researched several similar cordless (battery) versions, and even though I knew it wouldn't be as powerful as the Toro, I wanted something light and cordless. I didn't know how well it would work (or for how long), but mine arrived today and it performed beyond ALL my expectations (plus I'll actually use this one, since it's lightweight and doesn't have a cord to deal with). I cleaned all around my house (even being able to blow the large pile of leaves I had made just as I was finishing up), cleaned off the sidewalks, blew years worth of spider webs off the sides of the house (thanks to the California drought), and out of my cypress trees and boxwood hedges. Blowing the spiderwebs off the sides of the house was almost laughably easy, and MUCH easier than with water (which made them stick to the sides). Then I blew out my garage and driveway and STILL had power (all this took maybe 20 minutes). At the end I decided to blow out my garden kitchen floor, and it still had so much power (after everything else) it even lifted the rug in front of the door off the floor after. I wasn't expecting that kind of power even at the beginning of using this on a charge, but at the end, surprised me. 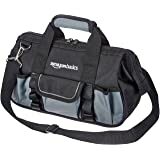 I'm very pleased with this product and would highly recommend it to anyone. 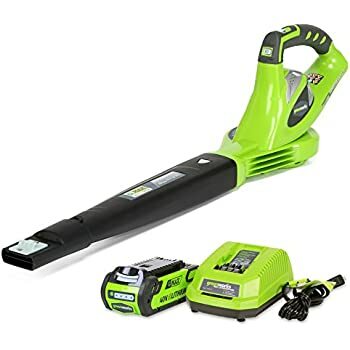 It's so lightweight and easy to use (and cordless) I'll be using it a few times a week instead of (grudgingly) twice a year. If something changes, or the battery charge or blowing power diminishes in time, I'll update my review then. In the meantime, I can't recommend this strongly enough.